From dating to the engagement to the wedding and honeymoon and anniversaries, there are many romantic moments in a couple's relationship. One great way to show those moments in pictures is with a romantic scrapbook. If you are looking for some ideas on where to get started building your "story of us," then look no further. Here are some ideas for memorable romantic scrapbook pages. 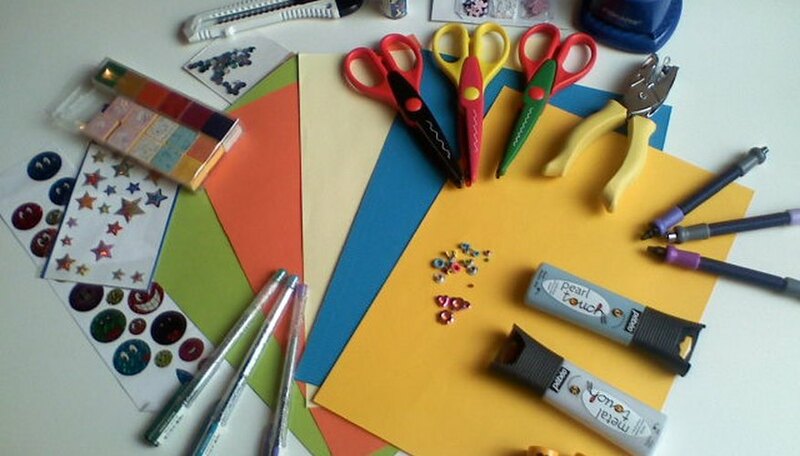 Elements of a scrapbook should be chosen carefully. The days of dating are filled with firsts. First kisses, first dances and first impressions. You can build your dating pages around those firsts using mementos, such as ticket stubs from the first movie you went to together or pressed flowers from the picnic where you shared a first kiss. Try to select photos that best represent the two of you as a couple. Weddings naturally lend themselves to scrapbooks, thanks to the wealth of photos that are taken during the event. Many professional wedding photographers use what is known as 'storytelling' photography to capture moments that tell a larger story about the event. Use these photos when scrapbooking to show how your event was unique. Embellish the pages with wedding favors, a copy of your invitation, newspaper announcements or flowers from the decorations. Other embellishments may include tulle or lace and ribbons. Each page of the ABC romance album is themed on a romantic idea that follows the letters for the alphabet. For example, the theme for the first page might be Adoration. The scrapbook page may contain a single photo, that of the groom the moment that he saw his bride walk down the aisle, along with a handwritten note explaining how he felt and what was on his mind in that moment. The second page can be themed around the word blissful, and contain photos of the couple that best remind each of them of feelings of bliss. Morris, Tracy. "Romantic Scrapbooking Ideas." Dating Tips - Match.com, https://datingtips.match.com/romantic-scrapbooking-ideas-5218740.html. Accessed 18 April 2019.